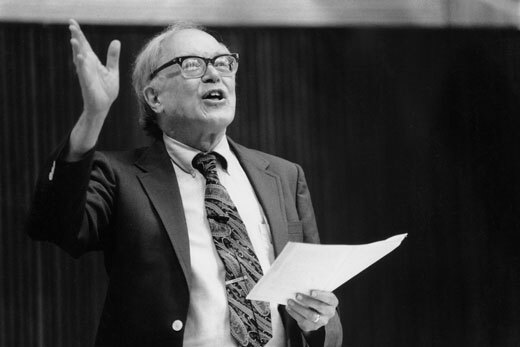 William "Bill" Mallard, professor emeritus of church history, was one of the longest-serving and best-loved professors at Emory's Candler School of Theology. William Mallard, one of the longest-serving and best-loved professors at Emory's Candler School of Theology, died Dec. 23. He was 87 years old. Mallard, professor emeritus of church history, is survived by his wife, Gatra, three adult children and five grandchildren. Mallard served on Candler's faculty for 43 years, from 1957-2000, during which time he shaped the lives of thousands of students, along with the school's culture and curriculum. A celebration of life is planned for Saturday, Jan. 3, at 2 p.m. at Glenn Memorial United Methodist Church, where the Mallards have been members since 1963 and Bill Mallard taught Sunday school for many years. David Pacini, professor of historical theology at Candler, recalled Mallard as a beloved teacher, esteemed colleague and inspired mentor. "Professor. Mentor. Husband. Father. Friend. Rapscallion. Radical. Pastor. Provocateur. Scholar. Singer. Song-leader. Bill Mallard was a formative presence in the lives of thousands of people, spanning several generations," Pacini writes in a remembrance included in a Candler news release. Pacini notes Mallard's membership in a group of faculty that was instrumental in Candler's early involvement in civil rights, his work as a driving force in the Graduate Division of Religion, and his accessible teaching style, among many other accomplishments. "We often think of lifetimes from the perspective of the exceptional and uncommon. Bill taught us that our lives happen between the memorable, amidst the commonplace, the white of winter among the colorless, where we visit the possible, often with a song of the Lord upon our lips," Pacini concludes. Read Candler's full memorial to William Mallard here. Read William Mallard's obituary in the Atlanta Journal-Constitution, including more details about memorial services.